I went looking and sure enough, there they are. 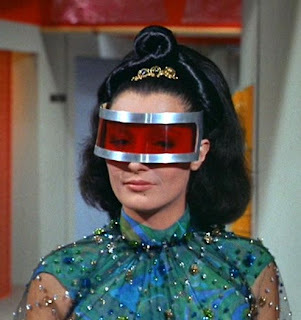 Screencap ^ from the Star Trek episode "Is There in Truth No Beauty?" (1968). "The standard equipment chair seen on the sets of the Enterprise were manufactured by a company in Texas called "Burke". 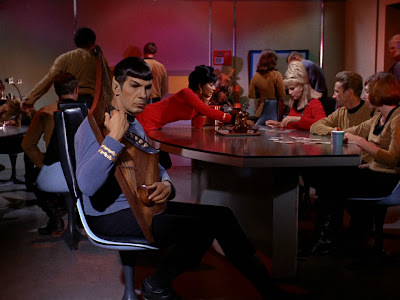 They were closely patterned after a similar chair by Saarinen except that they featured a four-blade 'propellor' base instead of the circular 'Tulip' base..."
You can see the base on the chair behind Spock's in this still from the 1966 episode "Charlie X." (It's harder than you might think to find a clear shot of an entire chair.) 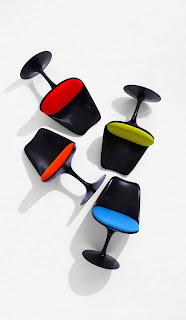 Eames' chairs also have a propeller base. 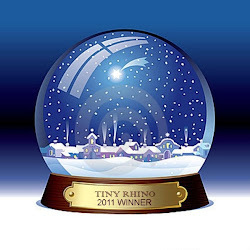 "O brave new world! That has such creatures in't." --Spock/Kollos quoting Miranda, from Shakespeare's The Tempest, in the 1968 Star Trek episode "Is There in Truth No Beauty?" Diana Muldaur (below, left) guest-starred in the episode as Dr. Miranda Jones. Advertisement, above right, for Eero Saarinen's Tulip Armchair [links to MoMA page], a classic of mid-century modern design, designed for Knoll in 1955-56. Miranda Jones is the companion of Kollos, an energy entity so different in appearance from humanoids that they must wear visors to protect against madness if they glimpse him. 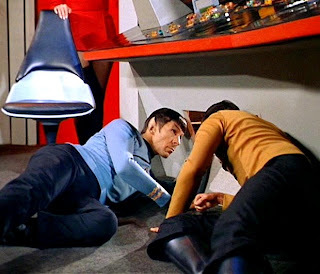 Left, Spock and Miranda transport Kollos (in the box). 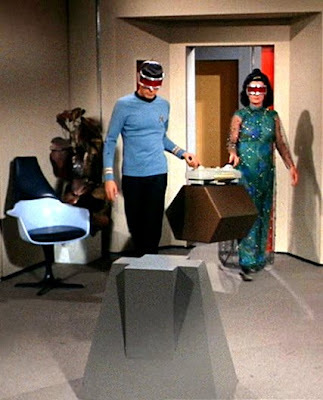 An IDIC medallion, which was introduced in this episode, is hereby e-bestowed upon Mortmere, in thanks for her telling me about the Saarinen/Star Trek connection. Infinite Diversity in Infinite Combinations, indeed! "When I see you, I... I feel like I'm hungry... all over. Hungry. Do you know how that feels?" Above, right: Charles Evans (Robert Walker) in the brig, from Star Trek's 1966 episode "Charlie X"
Fresca! 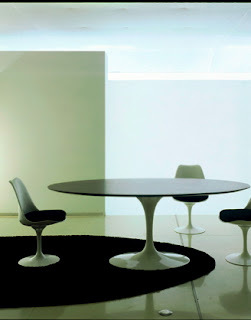 I didn't know the Tulip Chairs and Tables had been designed for Knoll, employer of my famous neighbors, "Bjork" and "Liberace". The ST style had totally escaped me and your highlights have captured my imagination. Envision a world in which we could all be stylin' like Veruschka, or like the fabulous Uhuru (P.F.Y.) with her fab abs! I love this series/project! 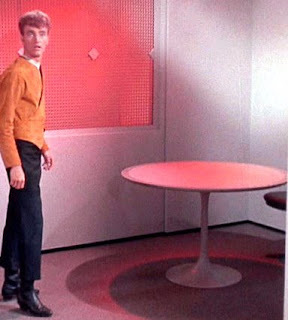 I read somewhere recently that Star Trek also influenced the imagination of designers of cell phones, but I can't remember where. And the Barcelona couch looks suspiciously like the beds in Star Trek. Momo: I love it too! It is taking over my brain. And yes, there's not only the question of how ST design reflected and influenced the 1960s but the future. That's been covered by the man himself--an overview, anyway, called "How William Shatner Changed the World". Shy? Our Bill? Never! HOW are you finding this stuff??! It is inspired. Clearly, this is a higher calling. 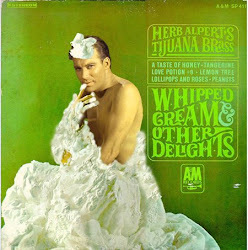 Hel-loooooo, Fresca, you're being called to write this book! Well, you know how it is, Library Grrrl... you just start with with one lead (Marimekko, in my case--that "Trouble with Tribbles" wall design reminded me of their bold, bright fabric design) and start following the threads. 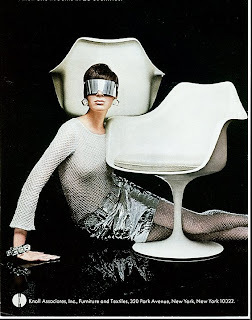 Fresca, I'm certain it isn't Veruschka in the Tulip Armchair ad but the model is surely Veruschka-esque. Oh, thanks for clarifying. (I can't even find the date of that ad...) Still need to tug on the thread of "Blow-Up". This is all making my head swim! Veruschka was an amazing model who did some off-beat work (tho' perhaps not really THAT far off) with body paints, posing as different wild animals. Thanks for the Knoll goodies!